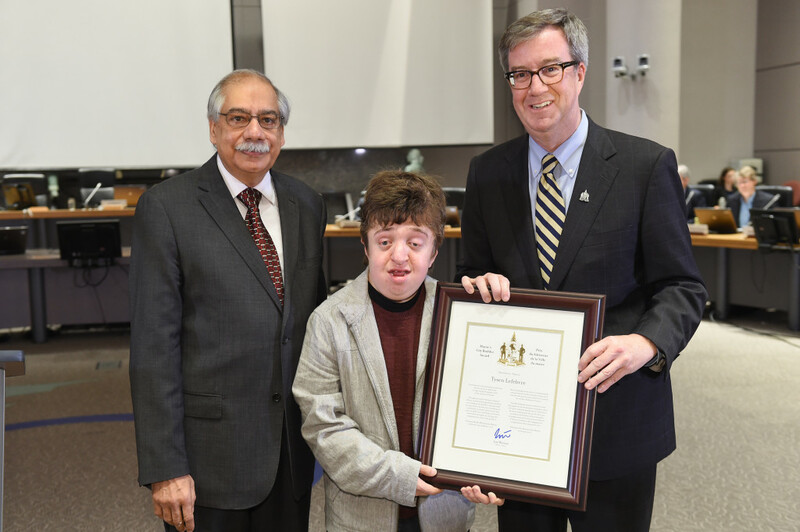 March 23rd, 2016 – Mayor Jim Watson and Stittsville Ward Councillor Shad Qadri presented a Mayor’s City Builder Award to Tysen Lefebvre at today’s City Council meeting. The 15-year-old youth was recognized for his tireless and enthusiastic work to raise funds for Make-a-Wish Eastern Ontario to make big wishes come true for children with life-threatening illnesses. In November 2012, Tysen had his own wish granted: to fly to Los Angeles to meet his hero, actor Adam Sandler, who does extensive philanthropic work while filming movies and raising his family. The actor’s generosity and hard work inspired Tysen to launch Mission to a Million the next year, an ongoing fundraising project to raise $1 million for Make-a-Wish so 100 local kids can have their wishes come true. This was a lofty goal for Tysen, who has Pfeiffer Syndrome Type 2, a rare genetic disorder that affects the skull, facial features and limbs. He had his first operation when he was nine days old and, by the time he was three, he had spent more than half of his life in hospital. He has more surgeries in his future, but he is always planning and working on how he can make life better for others. Tysen has a website (missiontoamillion.ca) and a Facebook page devoted to the campaign, but it is the time he puts into being the face and voice of Mission to a Million that has made it a remarkable success. To date he has inspired businesses, schools, children’s groups, philanthropic organizations and individuals to raise more than $360,000, and on March 14 he was on hand for the presentation of the 46th wish of the campaign. He says every time the funds raised by Mission to a Million grant a wish, it feels like having his own wish granted again.